Crown Heights is based painstakingly on true-life events, but if you’re not familiar with them before watching the film, then it plays out a lot like a particularly maddening mystery. We see events almost exclusively through the eyes of its two leads, and the injustices surrounding them are so grossly unfair that, in search of sanity, one starts flipping through a list of increasingly improbable reasons behind them: a scorned lover? Some kind of pre-internet analog identity theft? A witch’s curse? Due to the nonfictional nature of the film, I don’t feel terribly bad about spoiling it, but I imagine it’s easy to guess: There is no grand conspiracy, aside from America’s broken legal system. 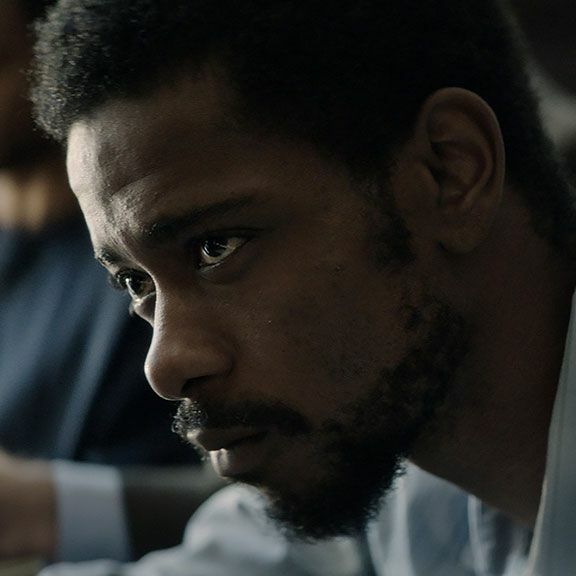 The film, written and directed by Matt Ruskin, follows the 21-year incarceration of Colin Warner (Lakeith Stanfield), a recent immigrant from Trinidad who, in 1980, was wrongfully accused of the murder of a teenage boy he’d never met. At his trial, Warner finds himself being named by witnesses he’d never seen before in his life, many of them younger than him. And due to his existing criminal record, the mostly white jury is willing to believe that he would murder a neighborhood boy in cold blood. He is sent to a maximum-security prison for a minimum sentence of 15 years. Meanwhile, his childhood friend Carl King (Nnamdi Asomugha) does everything he can to exonerate him, and together they study the law and attempt to appeal the verdict on technicalities. Every attempt is met with failure, until King is finally able to track down the witnesses, who, now in their adulthood, admit they’d been pressured to name Warner for the murder. The film is punctuated by subtitles counting the years away — 2, 6, 15 — with increasing implied incredulousness and accompanying time-marking footage of three American presidencies that all worked to fill prisons in their own unique ways. Crown Heights is as razor-sharp and focused on its historical context and the byzantine workings of the system it takes place in as its increasingly sobered leads. (At one point, King becomes so involved in Warner’s case that his wife leaves him, taking their children.) But in its rush to deliver its stream of facts and points on the timeline, I can’t help but feel as though something more vital is missing, something that can’t be conveyed in a piece of investigative journalism. Ruskin has two engaging, emotive leads at his disposal in Stanfield and Asomugha, and yet the film barely lets them absorb the emotional reality of what their characters are going through, continually sending them into action and conflict and rarely letting them reflect. Ruskin’s script never lets the foot off the pedal, which gives a dizzying momentum to the film, but not much personality. There are brief exceptions — a couple of hazy, impressionistic flashbacks to Colin’s life in Trinidad are moving and wordless, and stand in harsh contrast to his bleak life in prison. (Warner spent over four years in solitary, which the film blazes through in a few harrowing minutes that never seem to have any bearing on his character’s experience.) But those moments also make us realize how little we know about Colin outside of his 21-year brush with the law. He is the bad things that happen to him. He experiences major life milestones behind bars: His beloved grandmother dies, he falls in love with his childhood crush, and they get married. Ruskin figures these extreme, factual circumstances of love and injustice will speak for themselves, and he’s not entirely wrong; they are inarguably moving. But the film itself is an inert third party, watching a series of events play out. If Crown Heights plays out a bit like a whodunit podcast, there’s good reason: It’s based on a 2005 episode of This American Life entitled “DIY,” one of several episodes that, listening back, feels like proto-Serial material. What makes “DIY” and Crown Heights compelling, of course, is that the person Doing It Themselves is not the correspondent looking for a juicy story, but someone close to the wrongfully accused, who has a personal stake in the clearing of his friend’s name. Crown Heights recognizes the magnitude of that sacrifice intellectually, but cinematically it never quite gets its arms around it. We’re left floored by the facts of Colin Warner’s case; the film itself falls away.